The elaborate video production is the work of Tim Gracyk. 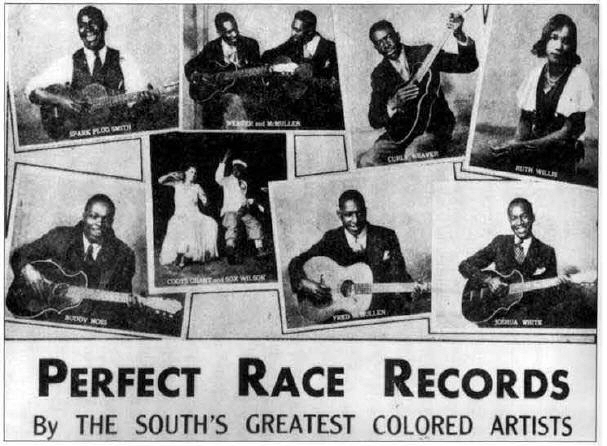 But what concerns me is that these African-American musicians were singing and playing a love song in praise of a specific locale “in the heart of Caroline,” a favorite of New York City / Hollywood songwriters — where a blue-eyed pair fall in love. However, when the Ellington band toured the American South, the roadside diners wouldn’t allow them inside or sell them food. Did it hurt to sing and play this song? On that same emotional path . . . Lorenz Hart was a gay man at a time when his love had to be concealed. (And he thought himself physically unattractive.) But he spent his career turning out one song after another in praise of heterosexual bliss, or at least bliss that a heterosexual listening public could identify as their kind of attachment. “With your wee head upon me knee,” in BLUE ROOM, is the first example that comes to mind, and there are many more. It’s very clearly a he-and-she marriage with a trousseau, the prospect of children, and more, in this sweet performance from 1926 by the Revelers. Did that wound him with each new song? We can’t know, but merely considering these hurts is in itself painful. We still recoil in horror and shame when confronted with photographs of COLORED and WHITE drinking fountains and entrances . . . or at least I hope we do. 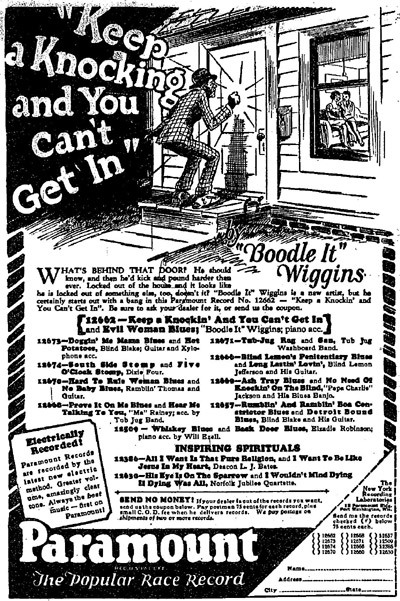 And I know that Alistair Cooke’s announcements on the jam sessions broadcast for the BBC in the late Thirties — announcing players by race, as if radio listeners needed to be protected from Negritude entering their living rooms — still startle unpleasantly. But what should we make of this article, possibly sold around 1939? 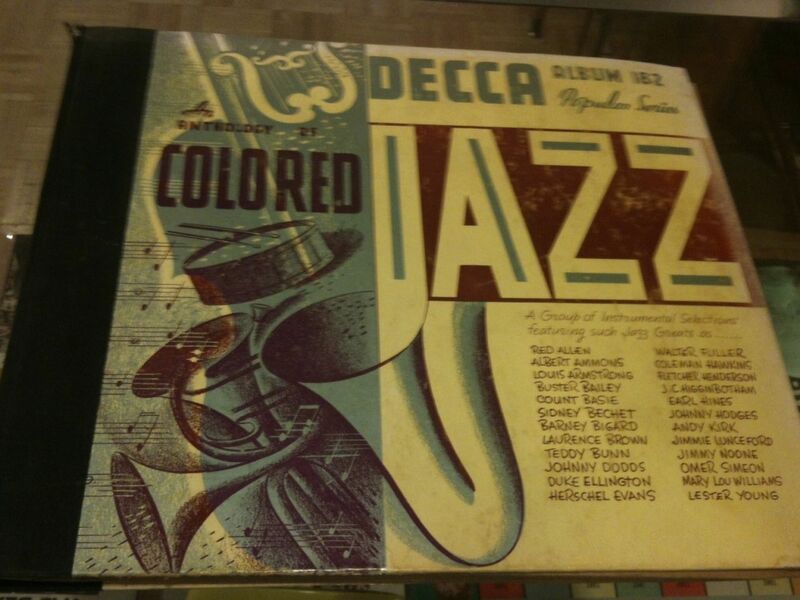 Was Decca suggesting that this was “authentic,” as in “We have the real stuff on our records,” an attempt to woo the JAZZMEN audience, or was it a way of warning off a racially-charged audience, “This is that degenerate stuff. Keep the women and children a safe distance away”? I can’t tell. But since I think few listeners have their music categorized by racial / ethnic characteristics, this record album has not lost its potential to shock. The music inside, of course, is colorful yet without pigmentation. 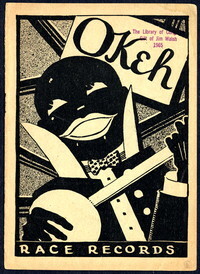 Often insulting, demeaning pictures — to sell extraordinary music, primarily to the audience being mocked by the pictures. Records falling from the skies seems a good thing, but not for shellac 78s. 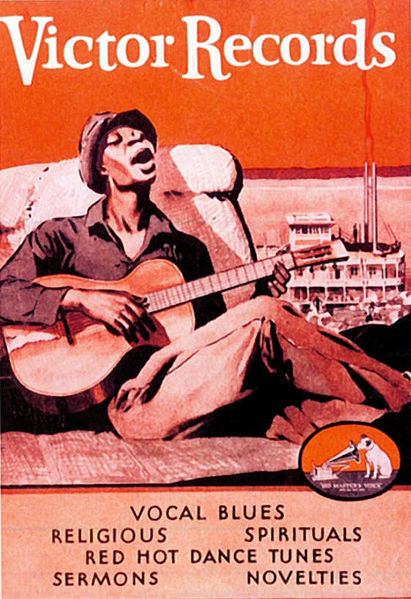 The “Dusky Stevedore” singing down on the levee — material for a sozen popular songs of the period. 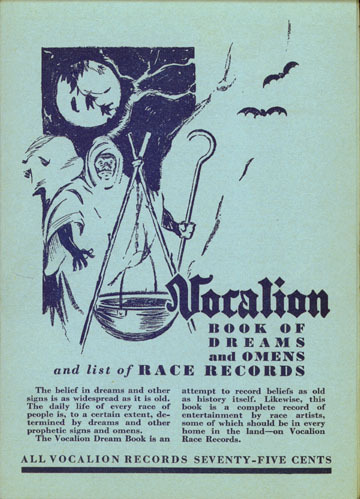 Those colored people were very superstitious, you know. And their home life was sometimes less than orthodox or well-behaved. 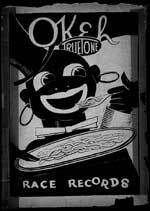 This, from the label that brought us Louis Armstrong’s Hot Five and Hot Seven. Splendidly offensive — nineteenth-century caricature. At least this advertisement — straightforward and plain — doesn’t thumb its nose at the people expected to buy the product. What’s the moral? Perhaps it is that beauty, given enough time, transcends such condescension and prejudice. I wish that the title of this posting referred to some newly unearthed recordings that had both of these jazz poets improvising together. Unfortunately, although such a meeting might have taken place, the recorded evidence may not exist. Newton, whom I’ve written about before, remains beautiful yet shadowy. The sensitivity we hear in his playing also made him one of jazz’s revered yet most elusive figures. That same sensitivity apparently made him a man greatly burdened by the injustices around him: racial prejudice coupled with the inartistic nature of “the music business.” Surely the frequent periods of illness he suffered were not merely the result of a frail constitution: he had power and self-assurance. But they seem to be necessary periods of retreat from a world that repelled him. Pee Wee Russell lived longer and had more opportunities to play and create alongside everyone from Arthur Schutt to Bobby Hackett to Thelonious Monk. But he, too, was hampered by factors that he must have found demeaning: the musicians who had once cherished him treated him more as a clownish spectacle, someone who made freakish sounds and faces. The Jazz Museum in Harlem will be devoting a Saturday afternoon to Newton and Russell. On March 28, from 10 to 4, they will be celebrating the lives of these two creative improvisers. Not, mind you, in the usual way, by simply playing their records. I would guess that they would show us Newton and Russell on film (Pee Wee shows up in a variety of contexts over the years; Newton, I believe, is only visible once, if that). But we will get to hear about these two men from people who were there. Readers of this blog will know the value I place on first-hand testimony, especially since the original players and the people who witnessed their miraculous work are becoming fewer. Here’s the list of esteemed, eloquent testifiers: Nat Hentoff, Dan Morgenstern, George Avakian, and George Wein. The panel will be held at the National Jazz Museum in Harlem Visitors’ Center, at 104 East 126th Street. And it’s free. “Don’t miss it!” is a real cliche when the event doesn’t warrant it, but it means something for an event like this. And in the meantime, I hope readers can remind themselves of the beauties Newton and Russell created for us to hear.